from our beginning to current! 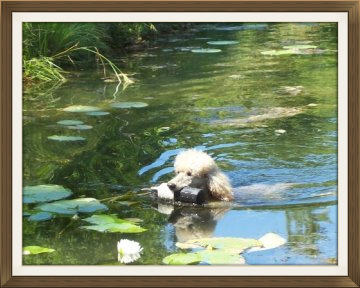 We will eventually update this page with not only photos of our Standard poodles retrieving in the field and water but with numerous videos as well. 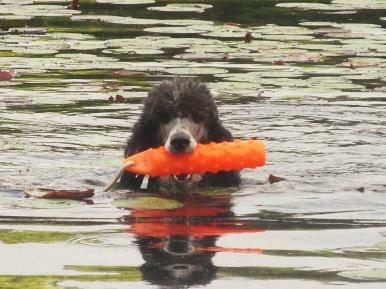 Training days and puppy introductions to water/swimming and live birds will be posted. 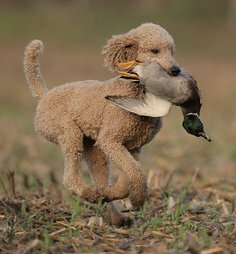 Also any photos of our poodle kids in other homes retrieving will be added as well to show what our next generations are doing. 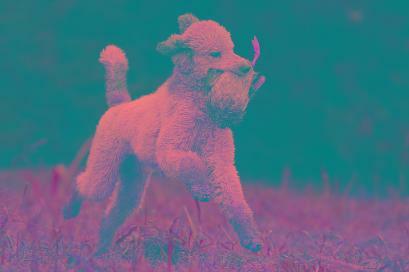 Our first poodle to show interest in retrieving was our apricot stud dog, Rene'. He loves to swim and was a natural. 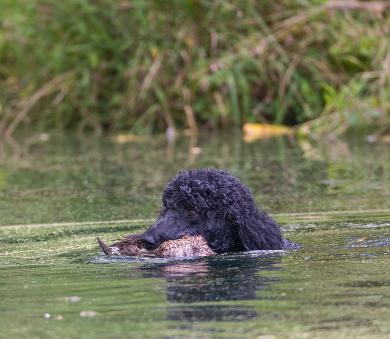 Our interest in retrieving didn't come about until Rene' was an adult dog so most of his retrieving was just for fun. To the right is a photo of one of his training days with a group of avid duck hunters and their dogs. 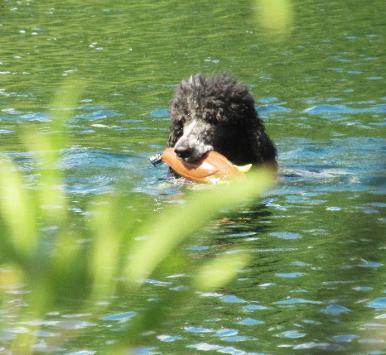 Rene' would surprise them with his desire to bring back his bumper or bird no matter how difficult the retrieve was. This is one of Rene's training days for water. 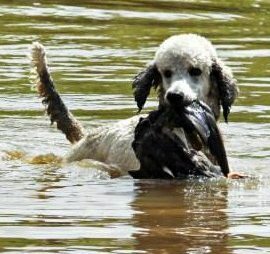 Rene' produced a litter of gorgeous apricot puppies for a friend of ours and one puppy in that litter went on to earn a Master Hunter title with his owner, Ann Marie.....click here for some great photos of "Jake"
retrieving dummies at a near by lake before he left. 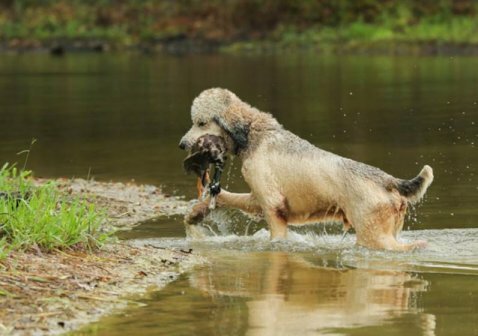 River has both his AKC Senior Hunting Retrieving title and his UKC Seasoned title. Here is a link to River's page. Jewel is our "first girl" to retrieve. She was introduced to water at about 8 weeks of age and proved to be a natural swimmer. She is the black puppy in the video below. Go to Jewel's page for more photos. She has been handled completely by us and has a number of "Working Certificates and her UKC Started title. 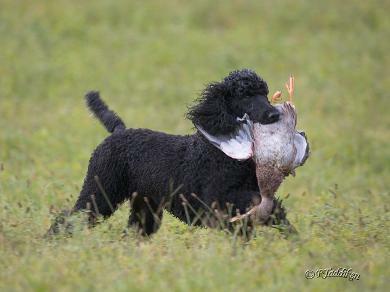 She is currently retrieving and is half way to her AKC Junior Hunter title. We bred our parti line into our solid retriever line and produced some naturally camoflouged puppies. We quickly started them in water using a kiddy pool as the lakes weren't warmed up yet. Eventually things warmed up and we took the puppies to the lake at about 11 weeks old. Gunner is the apricot and white parti puppy in the videos above. 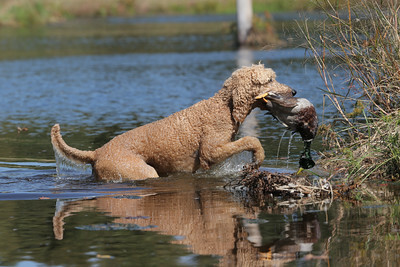 Photos below currently showing him earning both his AKC Junior Hunter Retriever title and his UKC Started title making him the "first male" parti-colored standard poodle to do so. He will continue to the next Senior/Seasoned level for 2019. Take a look at Gunner's page. Our Charli is well on her way to becoming a retriever also. 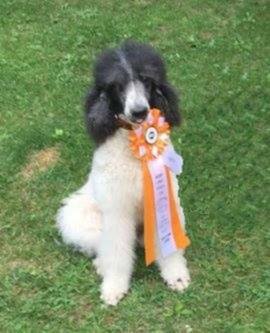 She has her first pass towards her AKC Junior title. She is the sister of Gunner above and was one of the puppies in the video above as well. Look for Charli earning her first official retrieving title in 2019. Go to Charli's page for more information. 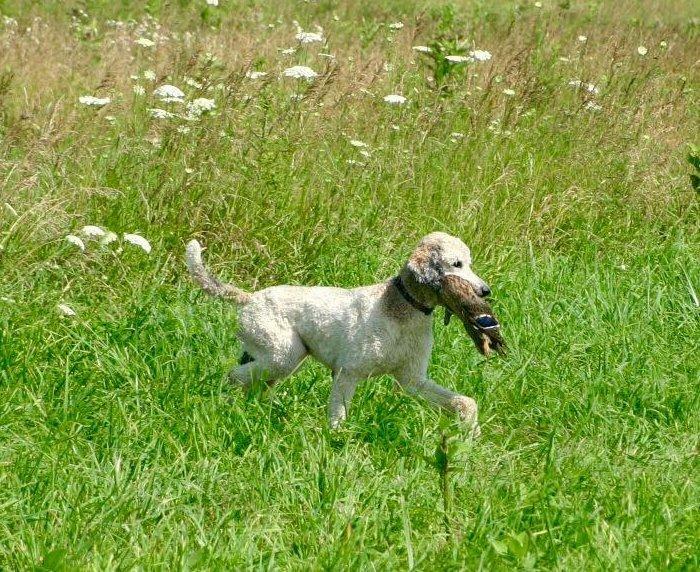 First pass towards her AKC Junior hunting title! Charli does Great on land for her first HRC test!